Make no bones about it - Mattel messed up their Ghostbusters line. Big time. In every conceivable way possible. From poor likenesses (why, oh why, can't the prototypes look anything like the final product, instead of looking closer to the Real Ghostbusters cartoon than the actor?!) 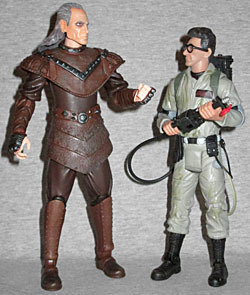 to reused bodies (apparently every Ghostbuster, regardless of height or body type, has the same body) to the usual terrible MattyCollector distribution, there hasn't been anything Mattel has been able to do right. I can't think of another company so inclined, so driven to punish their fans than Mattel. Consider that collectors have been clamoring for an accessory pack to go with their (not great) 'busters, so that the quartet can all have proton streams - naturally, none of that. Instead, they ruin the last potentially great aspect of their doomed series, the Ecto-1, creating an incredibly detailed and cool in-scale recreation of the famous vehicle, then overpricing it like the dickens. When Mattel's own classic Batmobile only costs $60 in stores, why should the Ecto-1 cost over $200? Adding on shipping, the cost approached the same as the much bigger and more detailed Castle Greyskull. It's no wonder it failed, and now we're without what could have been an amazing piece for our collection. But no matter, there's no point in dwelling on such things. Today I'm covering what is arguably the "last hurrah" for this line, Vigo the Carpathian, the antagonist from the unfairly maligned Ghostbusters 2. 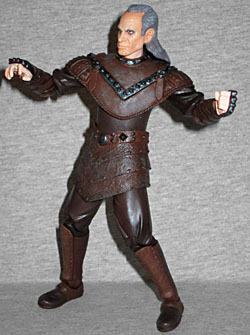 Vigo stands about 6⅝" tall, which is much taller than the others in this line. Does this make him slightly out of scale? With the generally crappy quality across the Ghostbusters figures, does it even matter? His height is quite nice: he's notably bigger than the quartet and thus looks intimidating above them. That's more than one can say for his overall sculpt, which, while mostly accurate, with appropriate detailing across his awesome costume, suffers from the head. It isn't that the likeness is bad - keeping in mind the rest of the line he looks pretty much excellent for the character - but the size of the head is out of whack with the rest of his body. It's like, in their inability to find the right size for this figure, they put the body and heads together separately and ended up with a strange combination that reminds, in a way, of the "Big Head" modes in videogames. It's not that bad, but it is noticeable and annoying. Which is a shame, as the paint and detailing on the toy is really cool. I can't comment on the authenticity of the costume, but it's appropriately detailed with little skulls and other bits, and the paint application is excellent. It's even great on the face itself, which looks appropriately pissed off for someone stuck in a painting for many years. The plastic used for his skin is, unfortunately, a bit too plasticky, matched with what appears to be a gloss that makes him appear off. While the majority of the costume is excellent it does limit the otherwise terrific articulation; his head, for example, gets in the way of the balljoint in his neck. Ditto the balljointed shoulders and his big shoulderpads, and his balljointed legs and his skirt. There really wasn't a good way around this, and because of the character it hardly seems like he should be doing ballet, so it's not as notable as the wacky oversized head. The rest of his articulation is also excellent, with joints at the elbows, boots, calves and wrists. With no biceps swivels, though, he can't do the "fists on his" pose you want him to. Credit where due - alongside the solid articulation and paint, Vigo comes with the only suitable accessory one could want, a recreation of the infamous painting in which he resided. It's a big lenticular image, wherein moving it from side to side removes Vigo from the painting. Awesome!! To make things even better, turning it around has the amusing sight gag that ended the film. The only drawback is that there's no stand to hold it up, which is exactly the kind of oversight we expect from Mattel. So, overall, Vigo is a mixed bag, but he comes up more positive than negative due to being such a big, cool, imposing character, and with the clever accessory that will please Ghostbusters 2 fans (I don't think they would have got away with selling the toy without it). I really wish that head sculpt was better; as with the others from the line, it seems more fitting with the Real Ghostbusters than the actual live-action films. 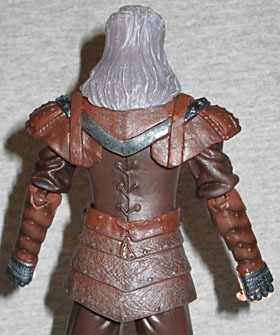 But chances are if you've collected this line you're probably okay with the generally poor headsculpts, and this slides right alongside the others to look, well, fitting. 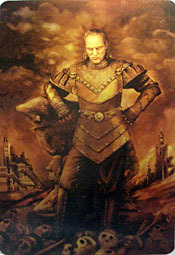 I like this Vigo the Carpathian. Just try not to think about what we may have got if NECA had fully worked the licence.